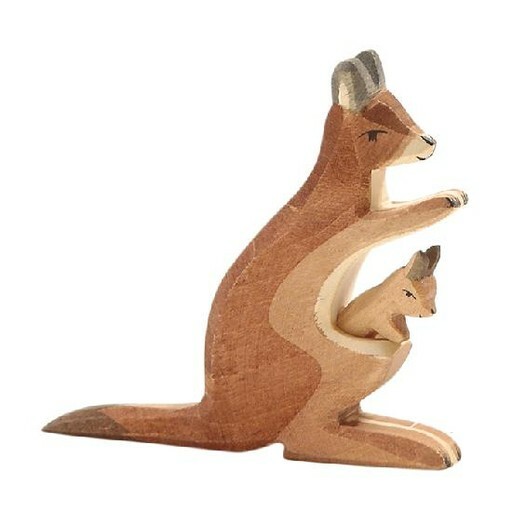 Ostheimer Wooden Toys - Kangaroo With Baby Height 11.5 cm CARE INSTRUCTIONS: For care simply use soapy water with a damp cloth for cleaning. Dry immediately. Please do not submerge in water and do NOT use disinfectant or hot water. Hand Crafting of each Ostheimer Piece: From the draft to the finished product Ostheimer toys pass through many hands while they are designed, sawed out, sanded, rubbed-off, painted, oiled, and shipped out: and each step in this long process of careful handcrafting is inspired by wish to give children toys of truly high quality to play with. This way, each Ostheimer wooden figures becomes a valuable individual piece of work. To bring the artistic layout into shape, the accurately drawn silhouettes of our figures are stamped onto the finely planed planks. Even at this point it is necessary to work with care, taking into account the shade and grain of the wood to suit the proportions of the figure. 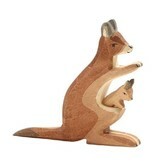 Carried out with flair and accuracy the sawing creates the basis for the correct profile of the figures. The pre-sanding removes sawdust and smooths the surface of the wood. Next, the lively form of the figures is created by an artist. Thus we create the characteristic form, which is distinctive for our toys. A soft final touch of the contours finishes the process of shaping our figures and prepares the surface for the following paint-work. Now our figures are gently painted by hand using a fine paintbrush. Thus, they get their tender, child-oriented appearance. Transparent colours allow the beautiful wood texture to amplify its warm charisma. An immersion bath in high-quality organic oil imparts our wooden figures with colour retention and protects the surface. Not before our figures have passed a final quality-check and been given the Ostheimer-seal of quality, are they carefully packed and delivered to children all over the world.